For other uses, see The Wind in the Willows (disambiguation). The Wind in the Willows is a children's novel by Kenneth Grahame, first published in 1908. Alternately slow-moving and fast-paced, it focuses on four anthropomorphised animals in a pastoral version of Edwardian England. The novel is notable for its mixture of mysticism, adventure, morality, and camaraderie and celebrated for its evocation of the nature of the Thames Valley. In 1908, Grahame retired from his position as secretary of the Bank of England. He moved back to Berkshire, where he had lived as a child, and spent his time by the River Thames doing much as the animal characters in his book do – as the book says, "simply messing about in boats" – and expanding the bedtime stories he had earlier told his son Alastair into a manuscript for the book. The novel was in its 31st printing when playwright A. A. Milne adapted part of it for the stage as Toad of Toad Hall in 1929. In 1946, the first film adaptation was released. In 2003, The Wind in the Willows was listed at number 16 in the BBC's survey The Big Read. More than a century after its original publication, it was adapted again for the stage in 2016 musical by Julian Fellowes. Kenneth Grahame was born on 8 March 1859 in Edinburgh. When he was 5, his mother died from puerperal fever, and his father, who had a drinking problem, gave the care of his four children over to their grandmother, who lived in Cookham Dean in Berkshire. There they lived in a spacious but dilapidated home, The Mount, in extensive grounds by the River Thames, and were introduced to the riverside and boating by their uncle, David Ingles, curate at Cookham Dean church. At Christmas 1865 the chimney of the house collapsed and the children moved to Fern Hill Cottage in Cranbourne, Berkshire. In 1866, their father tried to overcome his drinking problem and took the children back to live with him in Argyll, Scotland, but after a year they returned to their grandmother's house in Cranbourne, where Kenneth lived until he entered St Edward's School, Oxford in 1868. During his early years at St. Edwards the boys were free to explore the old city with its quaint shops, historic buildings, and cobbled streets, St Giles' Fair, the idyllic upper reaches of the River Thames, and the nearby countryside. Grahame married Elspeth Thomson in 1899, when he was 40; the next year they had their only child, a boy named Alastair (whose nickname was "Mouse") born premature, blind in one eye, and plagued by health problems throughout his life. When Alastair was about four years old, Grahame would tell him bedtime stories, some of which were about a toad, and on his frequent boating holidays without his family he would write further tales of Toad, Mole, Ratty, and Badger in letters to Alastair. In 1908 Grahame took early retirement from his job at the Bank of England and moved with his wife and son to an old farmhouse in Blewbury, where he used the bedtime stories he had told Alastair as a basis for the manuscript of The Wind in the Willows. With the arrival of spring and fine weather outside, the good-natured Mole loses patience with spring cleaning. He flees his underground home, emerging to take in the air and ends up at the river, which he has never seen before. Here he meets Rat (a water vole), who at this time of year spends all his days in, on and close by the river. Rat takes Mole for a ride in his rowing boat. They get along well and spend many more days boating, with “Ratty” teaching Mole the ways of the river, with the two friends living together in Ratty’s riverside home. One summer day, Rat and Mole disembark near the grand Toad Hall and pay a visit to Toad. Toad is rich, jovial, friendly and kind-hearted, but aimless and conceited; he regularly becomes obsessed with current fads, only to abandon them abruptly. Having recently given up boating, Toad's current craze is his horse-drawn caravan. He persuades the reluctant Rat and willing Mole to join him on a trip. Toad soon tires of the realities of camp life, and sleeps in the following day to avoid chores. Later that day, a passing motorcar scares the horse, causing the caravan to overturn into a ditch. Rat threatens to have the law on the car driver, while Mole calms the horse, but Toad's craze for caravan travel is immediately replaced by an obsession with motorcars. Mole wants to meet the respected but elusive Badger, who lives deep in the Wild Wood, but Rat – knowing that Badger does not appreciate visits – tells Mole to be patient and wait for Badger to pay them a visit himself. Nevertheless, on a snowy winter's day, while the seasonally somnolent Rat dozes, Mole impulsively goes to the Wild Wood to explore, hoping to meet Badger. He gets lost in the woods, sees many "evil faces" among the wood's less-welcoming denizens, succumbs to fright and panic and hides, trying to stay warm, among the sheltering roots of a tree. Rat wakes to find Mole gone. Guessing his mission from the direction of Mole's tracks and equipping himself with two pistols and a stout cudgel, Rat goes in search, finding him as snow begins to fall in earnest. Attempting to find their way home, Rat and Mole quite literally stumble across Badger's home – Mole barks his shin on the boot scraper on Badger's doorstep. Badger – en route to bed in his dressing-gown and slippers – nonetheless warmly welcomes Rat and Mole to his large and cosy underground home, providing them with hot food, dry clothes, and reassuring conversation: "It takes all sorts to make a world." Badger learns from his visitors that Toad has crashed seven cars, has been in hospital three times, and has spent a fortune on fines. Though nothing can be done at the moment (it being winter), they resolve that when the time is right they will make a plan to protect Toad from himself; they are, after all, his friends, and are worried about his well-being. With the arrival of spring, Badger visits Mole and Rat to take action over Toad's self-destructive obsession. The three of them go to Toad Hall, and Badger tries talking Toad out of his behaviour, to no avail. They put Toad under house arrest, with themselves as the guards, until Toad changes his mind. Feigning illness, Toad bamboozles the Water Rat (who is on guard duty at the time) and escapes. Badger and Mole are cross with Rat for his gullibility, but draw comfort because they need no longer waste their summer guarding Toad. However, Badger and Mole continue to live in Toad Hall in the hope that Toad may return. Meanwhile, Toad orders lunch at The Red Lion Inn, and then sees a motorcar pull into the courtyard. Taking the car, he drives it recklessly and is caught by the police. He is sent to prison for 20 years. In prison, Toad gains the sympathy of the gaoler's daughter, who helps him to escape disguised as a washerwoman. Though free again, Toad is without money or possessions other than the clothes upon his back. He manages to board a railway engine manned by a sympathetic driver, which is then pursued by a special train loaded with policemen, detectives and prison warders. Toad jumps from the train and, still disguised as a washerwoman, comes across a horse-drawn barge. The barge's female owner offers him a lift in exchange for Toad's services as a washerwoman. After botching the wash, Toad gets into a fight with the barge-woman, who tosses him into the canal. In revenge, Toad makes off with the barge horse, which he then sells to a gypsy. Toad subsequently flags down a passing car, which happens to be the very one he stole earlier. The car owners, not recognising Toad in his disguise, permit him to drive their car. Once behind the wheel, he is repossessed by his former exuberance and drives furiously, declaring his true identity to the passengers who try to seize him. This leads to the car landing in a horse-pond, after which Toad flees once more. Pursued by police, he runs accidentally into a river, which carries him by sheer chance to the house of Rat. Toad now hears from Rat that Toad Hall has been taken over by weasels and stoats from the Wild Wood, who have driven out Mole and Badger. Although upset at the loss of his house, Toad realizes what good friends he has and how badly he has behaved. Badger then arrives and announces that he knows of a secret tunnel into Toad Hall through which the enemies may be attacked. Armed to the teeth, Badger, Rat, Mole and Toad enter via the tunnel and pounce upon the unsuspecting Wild-Wooders who are holding a celebratory party. Having driven away the intruders, Toad holds a banquet to mark his return, during which (for a change) he behaves both quietly and humbly. He makes up for his earlier excesses by seeking out and compensating those he has wronged, and the four friends live out their lives happily ever after. In addition to the main narrative, the book contains several independent short stories featuring Rat and Mole. These appear for the most part between the chapters chronicling Toad's adventures, and are often omitted from abridgements and dramatisations. The chapter "Dulce Domum" describes Mole's return to his home with Rat where he rediscovers, with Rat's help, a familiar comfort, despite finding it in a terrible mess after his abortive spring clean. "The Piper at the Gates of Dawn" tells how Mole and Rat search for Otter's missing son Portly, whom they find in the care of the god Pan. (Pan removes their memories of this meeting "lest the awful remembrance should remain and grow, and overshadow mirth and pleasure".) Finally, in "Wayfarers All", Ratty shows a restless side to his character when he is sorely tempted to join a Sea Rat on his travelling adventures. Mole: Known as "Moly" to his friends. An altruistic, humble, loyal, polite, home-loving animal, and the first character introduced in the story. Fed up with spring cleaning in his secluded home, he ventures into the outside world. Initially overawed by the hustle and bustle of the riverbank, he eventually adapts. He proves intelligent as shown with his trickery against the Wild Wooders before the assault to retake Toad Hall. Rat: Known as "Ratty" to his friends (though actually a water vole), he is cultured, relaxed and friendly, and enjoys a life of leisure; when not spending time on the river, he composes doggerel. Ratty loves the river and takes charge of Mole. He can be stubborn when it comes to doing things outside his riverside lifestyle, but can do which must be done as shown when he risks his safety to help Mole in the Wild Wood and to help free Toad Hall from the weasels. Mr. Toad: Known as "Toady" to his friends, the wealthy scion of Toad Hall who inherited his wealth from his late father. Although good-hearted and optimistic, he is also arrogant, conceited, and impulsive. He is prone to obsessions and crazes (such as punting, houseboats, and horse-drawn caravans). He gets bored with each of these in turn, and drops them, finally settling on motorcars. His motoring craze degenerates into a sort-of addiction that lands him in the hospital a few times, subjects him to stiff fines for his unlawfully reckless driving, and eventually gets him imprisoned for theft, dangerous driving, and gross impertinence to the police. Two chapters of the book chronicle his daring escape from prison and subsequent adventures before meeting up with the Water Rat. Mr. Badger: A gruff but benevolent soul, Badger embodies the "wise hermit" figure. A friend of Toad's deceased father, he is uncompromising with the irresponsible Toad, yet hopes that his good qualities will prevail. He lives in a vast underground sett, part of which incorporates the remains of a buried Roman settlement. A brave and a skilled fighter, Badger helps clear the Wild-Wooders from Toad Hall with his large stick. Otter and Portly: A friend of Ratty with a stereotypical "Cockney costermonger" character. The extrovert Otter is tough and self-sufficient. Portly is his young son. The weasels, ferrets, and stoats: The story's main antagonists. They plot to take over Toad Hall. Although they are unnamed, the leader is referred to as "Chief Weasel". Pan: A benevolent and wise god of the wild who makes a single, anomalous appearance in Chapter 7, "The Piper at the Gates of Dawn" when he helps Portly and looks after him until Ratty and Mole come. The Gaoler's Daughter: The only major human character; a "good, kind, clever girl", she helps Toad escape from prison. The Wayfarer: A vagabond seafaring rat, who also makes a single appearance. Ratty briefly considers following his example, before Mole persuades him otherwise. Squirrels and rabbits, who are generally good (although rabbits are described as "a mixed lot"). Inhabitants of the Wild Wood: Weasels, stoats, and foxes who are described by Ratty thus: "All-right in a way but well, you can't really trust them". The original publication of the book was plain text, with a frontispiece illustrated by Graham Robertson, but many illustrated, comic, and annotated versions have been published over the years. Notable illustrators include Paul Bransom (1913), Nancy Barnhart (1922), Wyndham Payne (1927), Ernest H. Shepard (1931), Arthur Rackham (1940), Tasha Tudor (1966), Michael Hague (1980), Scott McKowen (2005), and Robert Ingpen (2007). The most popular illustrations are probably by E. H. Shepard, originally published in 1931, and believed to be authorised as Grahame was pleased with the initial sketches, though he did not live to see the completed work. 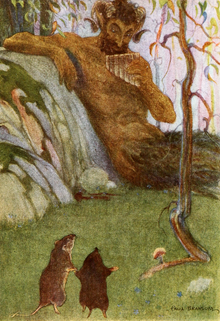 The Wind in the Willows was the last work illustrated by Arthur Rackham. The book with his illustrations was issued posthumously in a limited edition by the Folio Society with 16 colour plates in 1940 in the US. It was not issued with the Rackham illustrations in the UK until 1950. The Folio Society 2006 edition featured 85 illustrations, 35 in colour, by Charles van Sandwyk. A fancier centenary edition was produced two years later. Michel Plessix created a Wind in the Willows watercolour comic album series, which helped to introduce the stories to France. They have been translated into English by Cinebook Ltd.
Patrick Benson re-illustrated the story in 1994 and HarperCollins published it in 1994 together with the William Horwood sequels The Willows in Winter, Toad Triumphant and The Willows and Beyond. It was published in the US in 1995 by St. Martin's Press. Inga Moore's edition, abridged and illustrated by her, is arranged so that a featured line of the text also serves as a caption to a picture. Belknap Press, a division of Harvard University Press, published Seth Lerer's annotated edition in 2009. W. W. Norton published Annie Gauger and Brian Jacques's annotated edition in 2009. Jamie Hendry Productions published a special edition of the novel in 2015 and donated it to schools in Plymouth and Salford to celebrate the World Premiere of the musical version of The Wind in the Willows by Julian Fellowes, George Stiles, and Anthony Drewe. IDW Publishing published an illustrated edition of the novel in 2016. The hardcover novel features illustrations from Eisner Award-winning artist David Petersen, who is best known for creating and drawing the comic series Mouse Guard. A number of publishers rejected the manuscript. It was published in the UK by Methuen and Co., and later in the US by Scribner. The critics, who were hoping for a third volume in the style of Grahame's earlier works; The Golden Age and Dream Days, generally gave negative reviews. The public loved it, however, and within a few years it sold in such numbers that many reprints were required. In 1909, then sitting US President Theodore Roosevelt wrote to Grahame to tell him that he had "read it and reread it, and have come to accept the characters as old friends". A book that we all greatly loved and admired and read aloud or alone, over and over and over: The Wind in the Willows. This book is, in a way, two separate books put into one. There are, on the one hand, those chapters concerned with the adventures of Toad; and on the other hand there are those chapters that explore human emotions – the emotions of fear, nostalgia, awe, wanderlust. My mother was drawn to the second group, of which "The Piper at the Gates of Dawn" was her favourite, read to me again and again with always, towards the end, the catch in the voice and the long pause to find her handkerchief and blow her nose. My father, on his side, was so captivated by the first group that he turned these chapters into the children's play, Toad of Toad Hall. In this play one emotion only is allowed to creep in: nostalgia. The Wind in the Willows, a musical theatre adaption by Scot Copeland and Paul Carrol Binkley. The Wind in the Willows by George Stiles, Anthony Drewe and Julian Fellowes which opened at Theatre Royal Plymouth in October 2016 before playing at The Lowry, Salford and then later playing at the London Palladium in the West End. The Adventures of Ichabod and Mr. Toad, a 1949 animated adaptation produced by Walt Disney Productions for RKO Radio Pictures, narrated by Basil Rathbone. One half of the animated feature was based on the unrelated short story, The Legend of Sleepy Hollow. The Wind in the Willows, a 1996 live-action film written and directed by Terry Jones starring Steve Coogan as Mole, Eric Idle as Rat, and Jones as Mr. Toad. Toad of Toad Hall, the first live action film of the novel. Adapted by Michael Barry for BBC Television and transmitted live in 1946. The film featured (in alphabetical order) Julia Braddock as Marigold, Kenneth More as Mr. Badger, Jack Newmark as Mole, Andrew Osborn as Water Rat, Jon Pertwee as the Judge, Alan Reid as Mr. Toad, John Thomas and Victor Woolf as Alfred the Horse, Madoline Thomas as Mother, and an uncredited Pat Pleasanse as various rats, weasels, and mice. The Wind in the Willows, a 1969 TV series adaptation of the story produced by Anglia Television, told by still illustrations by artist John Worsley. The story was adapted, produced and narrated by Paul Honeyman and directed by John Salway. The Reluctant Dragon and Mr. Toad Show, a 1970–1971 TV series produced by Rankin/Bass Productions and animated overseas by Mushi Production in Tokyo, Japan, based on both The Reluctant Dragon and The Wind in the Willows. The Wind in the Willows, a 1983 animated TV film version with stop-motion puppets, produced by Cosgrove Hall Films. The Wind in the Willows, a 1984–1990 TV series following the 1983 film, using the same sets and characters in mostly original stories but also including some chapters from the book that were omitted in the film, notably "The Piper at the Gates of Dawn". The cast included David Jason, Sir Michael Hordern, Peter Sallis, Richard Pearson and Ian Carmichael. This series then had another TV movie made entitled A Tale of Two Toads and then a spin off series entitled Oh, Mr. Toad. The Wind in the Willows, a 1985/1987 animated musical TV film version for television, produced by Rankin/Bass Productions with animation by Wang Film Productions (also known as Cuckoo's Nest Studios) in Taiwan. 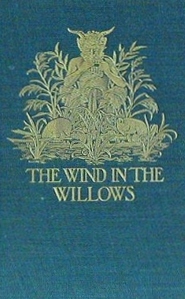 This version was very faithful to the book and featured a number of original songs, including the title, "Wind in the Willows", performed by folk singer Judy Collins. Voice actors included Eddie Bracken as Mole, Jose Ferrer as Badger, Roddy McDowell as Ratty, and Charles Nelson Reilly as Toad. Wind in the Willows, a 1988 animated made-for-TV film by Burbank Films Australia and adapted by Leonard Lee. The Adventures of Mole, a 1995 animated made-for-TV film with a cast including Hugh Laurie as Toad, Richard Briers and Peter Davison as Ratty and Mole respectively and Paul Eddington as Badger. Was followed by The Adventures of Toad. The Wind in the Willows, a 1995 animated TV film adaptation narrated by Vanessa Redgrave (in the live action scenes) with a cast led by Michael Palin and Alan Bennett as Ratty and Mole, Rik Mayall as Toad and Michael Gambon as Badger; followed by an adaptation of The Willows in Winter produced by the now defunct TVC (Television Cartoons) in London. In 2003, Guillermo del Toro was working on an adaptation for Disney. It was to mix live action with CG animation, and the director explained why he had to leave the helm. "It was a beautiful book, and then I went to meet with the executives and they said, 'Could you give Toad a skateboard and make him say, "radical dude" things?' and that's when I said, 'It's been a pleasure ...'"
In 2014, Classic Alice took the titular character on a 6 episode reimagining of The Wind in the Willows. Reid Cox played Toad, Kate Hackett and Tony Noto served as loose Badger/Ratty/Mole characters. Eight episodes from 4–14 April 1955, BBC Home Service. With Richard Goolden, Frank Duncan, Olaf Pooley and Mary O'Farrell. episodes from 27 September to 15 November 1965, BBC Home Service, with Leonard Maguire, David Steuart, and Douglas Murchie. Single 90 minute play, dramatised by A.A. Milne under the name Toad of Toad Hall, on 21 April 1973, BBC Radio 4, with Derek Smith, Bernard Cribbins, Richard Goolden, and Cyril Luckham. Three-hour reading by June Whitfield, Nigel Anthony, James Saxon, and Nigel Lambert; Puffin audiobook, 1996. In 2002 Paul Oakenfold produced a Trance Soundtrack for the story, aired on the Galaxy FM show Urban Soundtracks. These mixes blended classic stories with a mixture of dance and contemporary music. In 1983 Dixon Scott published A Fresh Wind in the Willows, which not only predates Horwood's sequels (see below) by several years but also includes some of the same incidents, including a climax in which Toad steals a Bleriot monoplane. William Horwood created several sequels to The Wind in the Willows: The Willows in Winter, Toad Triumphant, The Willows and Beyond, and The Willows at Christmas (1999). Jacqueline Kelly's sequel Return to the Willows was published in 2012. Jan Needle's Wild Wood was published in 1981 with illustrations by William Rushton (ISBN 0-233-97346-X). It is a re-telling of the story of The Wind in the Willows from the point of view of the working-class inhabitants of the Wild Wood. For them, money is short and employment hard to find. They have a very different perspective on the wealthy, easy, careless lifestyle of Toad and his friends. Kij Johnson published The River Bank in 2017. If Wild Wood reimagined Grahame's work through a shift of class, Johnson's work may be said to do the same thing through shift of gender. Mr. Toad was voted Number 38 among the 100 Best Characters in Fiction Since 1900 by Book magazine in their March/April 2002 issue. Mapledurham House in Oxfordshire was an inspiration for Toad Hall, although Hardwick House and Fawley Court also make this claim. The village of Lerryn, Cornwall claims to be the setting for the book. Simon Winchester suggested that the character of Ratty was based on Frederick Furnivall, a keen oarsman and acquaintance of Kenneth Grahame. However, Grahame himself said that this character was inspired by his good friend, the writer Sir Arthur Quiller-Couch. Grahame wrote this in a signed copy he gave to Quiller-Couch's daughter, Foy Felicia. The Scotsman and Oban Times suggested The Wind in the Willows was inspired by the Crinan Canal because Grahame spent some of his childhood in Ardrishaig. There is a proposal that the idea for the story arose when its author saw a water vole beside the River Pang in Berkshire, southern England. A 29 hectare extension to the nature reserve at Moor Copse, near Tidmarsh Berkshire, was acquired in January 2007 by the Berks, Bucks, and Oxon Wildlife Trust. The first album by psychedelic rock group Pink Floyd, The Piper at the Gates of Dawn (1967), was named by former member Syd Barrett after Chapter 7 of The Wind in the Willows. However, the songs on the album are not directly related to the contents of the book. Chapter 7 was the basis for the name and lyrics of "Piper at the Gates of Dawn", a song by Irish singer-songwriter Van Morrison from his 1997 album The Healing Game. The song "The Wicker Man" by British heavy metal band Iron Maiden also includes the phrase. British extreme metal band Cradle of Filth released a special edition of their album Thornography, called Harder, Darker, Faster: Thornography Deluxe; on the song "Snake-Eyed and the Venomous", a pun is made in the lyrics "... all vipers at the gates of dawn" referring to Chapter 7 of the book. The song "Power Flower" on Stevie Wonder's 1979 album Stevie Wonder's Journey Through "The Secret Life of Plants", co-written with Michael Sembello, mentions "the piper at the gates of dawning". In 1991, Tower of Power included an instrumental entitled "Mr. Toad's Wild Ride" on their album Monster on a Leash. Wind in the Willows is a fantasy for flute, oboe, clarinet and bassoon, narrated by John Frith (2007). Dutch composer Johan de Meij wrote a music piece for concert band in four movements, named after and based on The Wind in the Willows. The Edinburgh-based record label Song, by Toad Records takes its name from a passage in The Wind in the Willows. English composer John Rutter wrote a setting of The Wind in the Willows for narrator, SATB chorus and chamber orchestra. Mr. Toad's Wild Ride is the name of a ride at Disneyland in Anaheim, California and a former attraction at Disney's Magic Kingdom in Orlando, Florida, inspired by Toad's motorcar adventure. It is the only ride with an alternate Latin title, given as the inscription on Toad's Hall: Toadi Acceleratio Semper Absurda ("Toad's Ever-Absurd Acceleration"). After the removal of the ride from the Magic Kingdom, a statue of Toad was added to the cemetery outside the Haunted Mansion attraction in the same park. In 2016, the historian Adrian Greenwood was tortured and murdered in his home by a thief intent on finding a rare 1908 first edition print which he was in possession of. The book was later recovered as part of the criminal investigation. The crime was the subject of a Channel 4 documentary entitled Catching a Killer: The Wind in the Willows Murder. In The Simpsons' Episode 'Lisa Gets an A' (Season 10, Episode 7; AABF03) - Lisa neglects to complete her "Wind in the Willows" reading homework and subsequently has to cheat on a pop-quiz. ^ "The Big Read top 200". BBC. April 2003. Retrieved 17 January 2015. ^ Green, Peter (1983). "Chapter 1: Dragons and Pterodactyles 1859–1867". Beyond the Wild Wood: The world of Kenneth Grahame, author of The Wind in the Willows. New York: Facts on File. pp. 9–24. ISBN 0-87196-740-5. ^ a b c d "Biography". kennethgrahamesociety.net. Retrieved 1 March 2016. ^ Green, Peter (1983). "Chapter 2: The Spell of Oxford". Beyond the Wild Wood: The world of Kenneth Grahame, author of The Wind in the Willows. New York: Facts on File. pp. 29–40. ISBN 0-87196-740-5. ^ E. H. Shepard ill. ed, Charles Scribner's Sons, US, introduction. ^ a b Grahame 2009. ^ "Wind in the Willows musical set for world premiere". BBC News. ^ "The Wind in the Willows (Illustrated by David Petersen)". IDW Publishing. ^ "First edition of The Wind in the Willows sells for £32,400". The Guardian. 24 March 2010. Retrieved 4 November 2014. .
^ "The Wind in the Willows: short play or musical adaptation for children". David-gooderson.co.uk. 30 July 2005. Retrieved 17 June 2013. ^ "The Wind in the Willows (Musical, Copeland)". Dramatic Publishing Company. Retrieved 1 March 2017. ^ "Julian Fellowes to write Wind in the Willows Musical". ^ "The Wind in the Willows (1987) (TV)". Internet Movie Database. Retrieved 16 February 2009. ^ "Rotten Tomatoes: del Toro on why Wind in the Willows went away". Rotten Tomatoes. Archived from the original on 5 February 2009. Retrieved 9 May 2009. ^ Christine Paik (19 March 2002). "NPR report". NPR. Retrieved 26 February 2013. ^ West, Mark (2003). A Children's Literature Tour of Great Britain. Scarecrow Press Inc. pp. 49–51. Retrieved 17 January 2015. ^ Winn, Christopher (2010). I Never Knew That about the River Thames. Ebury Publishing. pp. 84–85. ISBN 9781407080604. Retrieved 17 January 2015. ^ "The animals of Wind in the Willows". Inside Out. BBC. 10 January 2005. Retrieved 26 February 2013. ^ Winchester, Simon (2003). The Meaning of Everything: The Story of the Oxford English Dictionary. Oxford, UK: Oxford University Press. ^ The copy with Grahame's inscribed identification of Arthur Quiller-Couch as an inspiration for Ratty was auctioned by Bonhams on Tuesday 23 March 2010 for £32,400. Flood, Alison (24 March 2010). "First edition of The Wind in the Willows sells for £32,400". The Guardian. ^ "Wind whispered in the Scottish willows first". The Scotsman. 16 April 2005. Retrieved 26 February 2013. ^ "Was Crinan the seed for Wind in the Willows?". Oban Times. 11 January 2008. Retrieved 26 February 2013. ^ "Ratty's paradise joins eight new reserves". Natural World. Spring 2007. p. 10. .
^ Travis M. Andrews (5 October 2016). "Historian tortured, killed for first edition of Wind in the Willows, prosecutor tells British jury". The Washington Post. Retrieved 5 October 2016. ^ "Wind in the Willows murder case a 'vicious' attack". BBC News. 10 July 2017. Retrieved 12 September 2018. Grahame, Kenneth (1944), Grahame, Elspeth (ed. ), First Whisper of The Wind in the Willows, Philadelphia & New York: J.B. Lippincott tells how the stories evolved from bedtime stories (and letters, in his absence) for his son Alastair, then known as "Mouse". Hunt, Peter (1994). The Wind in the Willows: A fragmented arcadia. New York: Twayne Publishers. ISBN 978-0-8057-8816-7. "online display of original manuscript, books, and drawings". Oxford: Bodleian Library. "Pictures and song excerpts from the American stage production". "The Wind in the Willows". scanned books. Internet Archive. "The Wind in the Willows". Read by Bernard Cribbins. BBC School Radio. CS1 maint: others (link) adapted in 10 parts. Site also contains teaching resources and episode transcripts.